David continues his work in Figurative Oil painting. The 20teens are about him painting nudes on surreal, subjective background settings that have originated in a previous purpose. An idea that is driven by recycling, he has been painting on random boards picked out of industrial trash. Boards chosen for an aesthetic just one step away from Art and then adding the Figure. 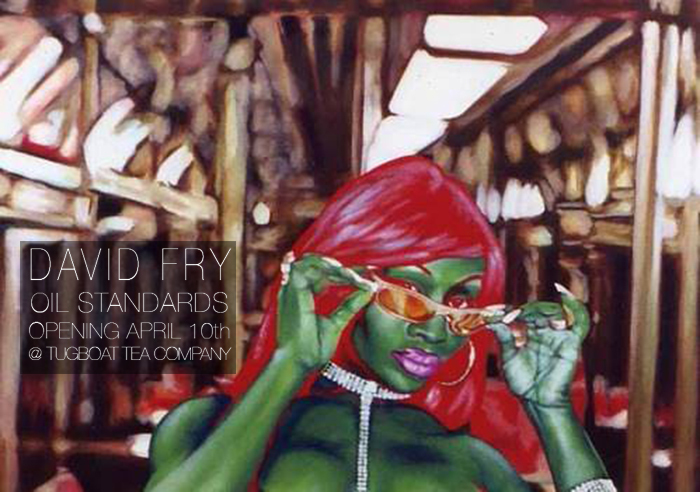 Oil Standards will also feature the premiere showing of the entire 4X4X4X4 Oil on Cardboard panel matrix. This is an assembly of Archetype represented 4 at a time on 16 squares consisting of 64 images. His is also exhibiting two pieces from his transurreal Green Eyes series, green glasses provided. One is a magical Minus Green photo-negative and one is an Exquiste Corpse. My paintings are merely a prepared surface that I have polished with colored Oils until a beautiful image appears. I would like to thanks PLG Arts and Tugboat Tea Co for this opportunity to show my work on Flatbush Avenue.